The Savager is a dreadnought class ship for the Substrate. Dreadnought Destroyer - High armor-piercing allows the Savager to duel any Dreadnought. This dreadnought destroyer tends to vaporize whatever has its focus; the 4 mounted Ion Cannons quick-fire energy to keep incoming ground and air threats at bay while its mysterious WMC weapon deals heavy damage with full armor-piercing to any ground targets foolish enough to get too close. Can upgrade to a Polaron anti-air beam. Quick-firing energy projector for keeping incoming ground and air threats at bay. Mysterious Substrate weapon that does heavy area damage to ground targets. Immediately restores 5000 health to the Dreadnought by deploying a cloud of short-lived nanites. Doubles the Dreadnought's rotation speed by using additional lateral thrusters. Unlocks power anti-air beams effective against heavy air units. Beam weapon designed to strike enemy air targets from great distances. Increases the Dreadnought's damage against structures by 50% by employing battle-adjusted targeting data. Doubles the Dreadnought's shield recharge rate with advanced reactor design. Reinforces the Dreadnought with super-heavy armor (+20% armor) by adding ablative Durantium plating beneath its outer hull. Increases the Savager armor to 80%. Modulates the Dreadnought's main armament into an unrivaled destructive force. The Savager can be treated as a tier 3 Mauler, melting any tier 3 units if allowed to engage in close combat. Its strength is increased significantly once the Executioner upgrade is acquired. This allows it to beat the Prometheus in a duel, with equal upgrades. This upgrade is only available at level 4 however, meaning it's very rare to be able to acquire it. Despite its description and the nature of its weapons, it's still quite deadly vs cruisers (albeit less than the Retributor and/or Overmind). Approaching a Savager with a cruiser army will still incur quite some cruiser losses but you can eventually wear it down. 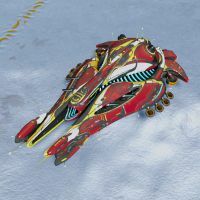 If there is no supporting army, the Savager can actually be taken down by swarming frigates, a very cost-effective method, although it is an unlikely scenario. This is, however, not true if the Shield Amplifier upgrade has been acquired. The Savager can also be used to clear defenses as its main weapon can target turrets. However, it does so in a brute force manner and will likely go down itself if the defenses is well fortified and has many Sentinel Turrets or Pulverizer Turrets or their upgraded versions. The Shield Amplifier upgrade can change the dynamics of how the Savager can be dealt with by non-anti-Dread armies. This upgrade significantly increases the regeneration of the Savager shield, allowing it to outlast smaller armies in combat and can cause cruisers armies to have a lot of trouble killing it when it's well-controlled. While this upgrade is also available to the Overmind, it's important to note that the Savager can acquire this at level 2, while Overmind has to reach level 4 to acquire it, a significant amount of experience difference. The Overmind also cannot acquire both Shield Amplifier and Durantium Armor upgrade due to them being in different tech paths, while the Savager is able to, making it even more durable. This page was last edited on 25 February 2019, at 04:11.